4 A4 sheets of iron-activated glue dots. Great for creative textiles and more - use to apply foils and other decorative effects. 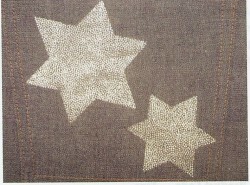 Each sheet consists of small dots of fabric glue which once used are washable. The product is also ideal for seamless hems. To apply: Make your design by cutting out the shape required from the bondadot sheet. Place the shape, glue dot side down, onto your fabric or card. Iron on as hot as temperature as possible, between two pieces of baking parchment. Once cool peel off the brown backing paper. Now the dots have adhered to the fabric/card you can add glitter, foils or other items, and then cover carefully with baking parchment. Iron on a medium setting, and once cool remove excess material used (foil, glitter etc. The piece is now fixed.